Haunted landscapes characterise the worlds within the medium of folk horror, creating fictional spaces in which pagan tradition collides with Christian demonology. 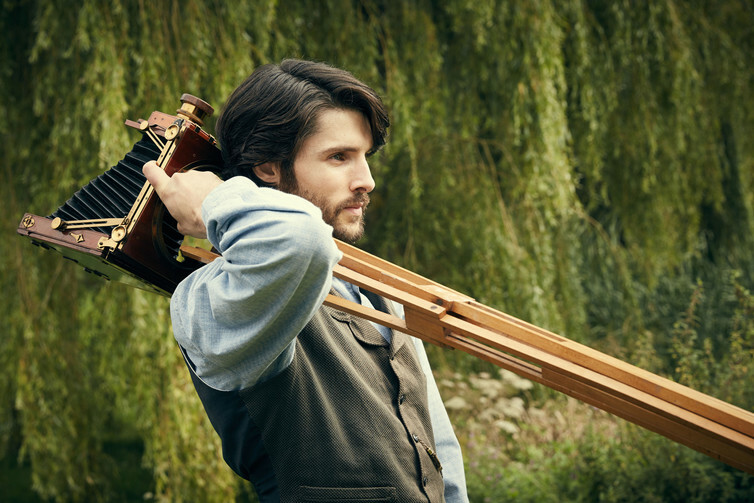 The narrative of the BBC’s recent series The Living and the Dead exists within this creative environment, following the story of Nathan Appleby and his wife, Charlotte, as they move to rural Shepzoy in Somerset in the year 1894. Arriving from the nation’s busy, cultivated capital, Shepzoy is a culture shock for New Woman Charlotte and a frightening return to the past for Nathan, whose family has long run the community’s farm. 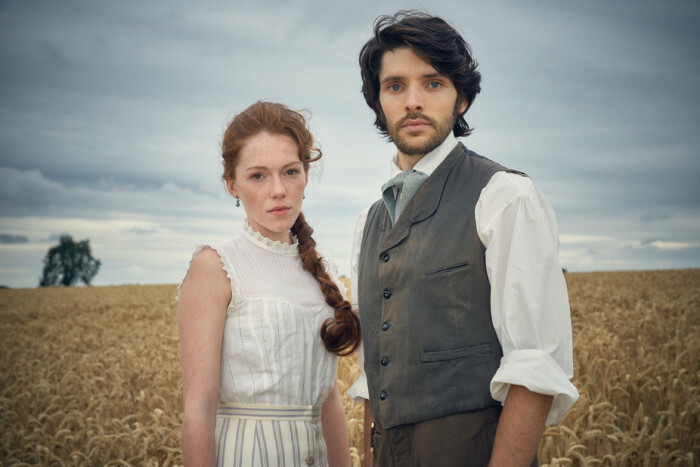 As his mother ails, the couple must adjust to the old world of rural Somerset, a setting straight out of a Thomas Hardy novel. For a more general overview of the series, Melissa Dickson’s and Alison Moulds’ reviews are both great. In this series of blog posts, I will be exploring different components of the programme, and these will include many spoilers. It is an excellent programme, and I recommend taking the time to watch it if you have not had the chance to do so already. In this post, I intend to focus upon Charlotte Appleby. Sensible, headstrong Charlotte, sharing a Christian name with the Bronte sister who wrote the enduring words ‘I am no bird; and no net ensnares me; I am a free human being with an independent will’, it is made clear that the new Mrs Appleby is a force to be reckoned with. Clear eyed with cascading red hair, Charlotte represents the Pre-Raphaelite beauty of the nineteenth century’s earlier decades whilst embodying the powerful iconography of the New Woman. A woman with no experience of living somewhere as pastoral and superstitious as Shepzoy, Charlotte rolls up her sleeves to adjust to rural life. Choking on the strength of some local cider brandy – ‘It’s strong,’ warns Nathan, ‘So am I,’ Charlotte laughs – The Living and the Dead demonstrates from the offset that she is no passive, weak-willed Victorian wife, but a driving force in the Appleby’s relationship and the world around her. Both women are independent and fierce proto-feminists, but despite this, Charlotte cannot escape from the expectations of her role as ‘Victorian woman’, and specifically as the replacement Mrs Appleby after Nathan’s mother passes away. As she helps the female staff at the house clean her mother-in-law’s body in preparation for burial, Charlotte listens as they discuss the departed woman in terms of her feminine roles – ‘good mistress’, ‘good mother’, ‘good grandmother’. Prized for her successful relationships with those around her – the hallmark of value for a Victorian woman – it is implied that Charlotte is expected to take on these roles. It’s made clear, however, that Charlotte does not end her ambitions at wife and motherhood. In her book Girl Trouble: Panic and Progress in the History of Young Women, Carol Dyhouse discusses the New Woman: ‘Part journalistic and fictional stereotype, part a reflection of social trends, the hallmark of the New Woman was that she rejected the mid-Victorian ideal of the Angel in the House. She would not be content with domesticity and self-sacrifice. She sought self-development instead’. Charlotte is progressive enough to recognise that she can have both worlds – although she is determined to be a good wife and eventually a mother, Charlotte also neatly encapsulates the iconography of the emancipated New Woman. In The Living and the Dead, the male servants of the house sense this – ‘the world will change, you’ll see’ – and resort to traditional folkish superstition in the face of their shifting universe, hanging a piece of greenery at the entrance to the farmhouse. This notion of Charlotte as representative of the changing world, both in the village of Shepzoy and on a larger cultural scale through embodying the ideals of the New Woman, can be explored more fully in her role as photographer. As bringer of new technology, pioneering Charlotte represents a moment in history when women became associated with and empowered by the commercialisation and accessibility of photography. Female engagement with the creation of photography was hotly contested towards the end of the nineteenth century. In a recent article, Harriet Riches explores this further by discussing the ways in which women’s roles in photography have been delineated as traditionally ‘feminine’. Debates about photography as either an artistic medium or a process of mechanical copy were ‘expressed through the language and visual imagery of the female body’, particularly in terms of the format’s theme of reproduction. The concept of woman as photographer was appropriated by the late nineteenth century consumer world as a way of capitalizing on the cultural currency of the ‘Woman Question’. It has been argued that the connection between fin de siècle femininity and photography is often remembered in association with the notorious ‘Kodak Girl’ image from a long running advertising campaign. Fashionably dressed with modern hairstyles, the Kodak Girl reinvents the well-known Gibson Girl illustrations by using the visual iconography of the New Woman concept. An ‘appealing vision of progress and modernity’, the Kodak Girl was ‘pictured out of doors riding her bicycle, driving her car, enjoying the sea air at the beach.’ The New Woman of the photographic world, the Kodak Girl represented the emancipation that the medium arguably brought to women. Charlotte Appleby, who represents this embodying of the proto-feminist ideals of the Kodak Girl model, also fulfils another role determined by the Victorian association of femaleness and photography. Aside from the capitalistic appropriation of the ideal of the ‘liberated woman’ for financial gain, there is another aspect of female devaluation in this Victorian association of femininity and photography. Women were often either removed from the ‘scientific’ photographic practice or framed as the ‘handmaid’, the passive assistant in the act of creation, often relegated to mindless and repetitive roles in the production of photography. A nod to the traditional role of ‘handmaid’ as wet nurse or even bearer of a master’s heirs, the term is undeniably gendered. She forms a bridge between one world and the next – master and child, or, in the case of photography, artist and creation. Photography was ‘the strange hybrid’, the ‘offspring of marriage between photographer’s mind and the object that lies before him…half-stamped with his own features, half with those of Nature’. In photography, the handmaid not only served a supposedly passive feminine role of reproduction in creating images, but therefore also served as a translator or communicator between artist and creation, working as the ‘medium for the age’. This idea of woman as medium between two worlds is echoed in the era’s fascination with Spiritualism and séances, and Shepzoy, of course, is a world populated with the dead as much as the living. Charlotte unwittingly plays the role of medium for the collision of two worlds through her technical knowledge of photography, and her introduction of such technology to this sphere means that she fulfils the role as medium of both reality and reproduced image, and the world of the living and of the dead. In her book Phantasmagoria, Marina Warner states that ‘seers acted as intermediaries between worlds; in the early 1850s, when the Fox sisters and other began rapping, the word ‘medium’ itself was extended to someone with paranormal powers’ . The role of ‘the woman’ is crucial to both the photographic and Spiritualist spheres, and the ethically doubtful commercial ‘feminism’ of the Kodak Girl is reflected in the valuation of women in the role of the Spiritualist medium. During the nineteenth century, women were often favoured as mediums by those who ‘valued their uneducated minds as truer vehicles’, emphasising that their supposed ‘purity’ made them ideal subjects to be imposed upon by the ‘forces’ of the spirits to create contact – much as the handmaidens of photography were imposed upon by their masters to create images. As we have seen, Victorian women played an important role in both spiritualism and photography, and they are very present in the historical intersection of these two spheres. Warner suggests that ‘spiritism or psychic science and domestic photography combined to bring Victorian women to the fore as active practitioners; the two very different activities overlap in the psychic photograph’ . The camera as a technical appliance in the domestic sphere was introduced contemporaneously with the Victorian pursuit of spirits, and both séances and spirit photography often took place in private houses. 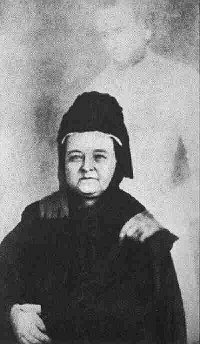 Women became leaders of psychic circles, outnumbering men as conductors of séances and spirit photographers. The Fox sisters called themselves ‘celestial telegraphers’, emphasising the era’s link between developing technology and expanding horizons, and naturally, the Victorians sought to capture ‘evidence’ of this newly-discovered spirit world with the technical advances of photography. In the nineteenth century ‘photography was recording occurrences in the laboratory which the human eye could not see, and its evidence was increasingly relied on’. Understandably, the high point of spirit photography’s popularity coincided with these scientific events. This historical factor is creatively interpreted in The Living and the Dead, as Charlotte unwittingly creates a spirit photograph while capturing the inside of the old mill in Shepzoy. Occupied with her husband while capturing the image, Charlotte later spots the outline of a woman emerging within the picture whilst developing her negatives in the dark room. A woman of scepticism and science, she seeks for a rational explanation in the flaws of the medium, claiming it ‘must be imperfections in the silver bromide’. Women, Jennifer Tucker claims in her book Nature Exposed: Photography as Eyewitness in Victorian Science, often played a ‘key role as makers and consumers of spirit photographs […] female mediums played a crucial and often overlooked role in promoting spirit photography by suggesting that sitters have their photograph taken’. 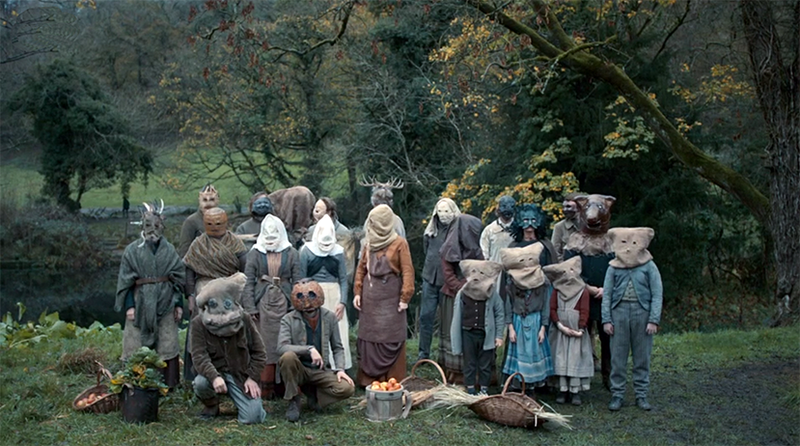 In The Living and the Dead, Shepzoy marks the years since the Allhallows Massacre, and Charlotte photographs the farm workers and the families in their (decidedly folk horror-ish) Halloween costume masks, roping Nathan in to stand with his friends for the image. The rope of an old swing creaks, like a gallows, and the picture is taken. Later, as Charlotte sorts through the images, she spots the figure of a little boy clutching a boat in the background, the ghost of Nathan’s son, the departed Gabriel. Charlotte is resistant to any notion of the metanatural at Shepzoy, and initially neglects to inform Nathan of his dead son’s manifestation in an attempt to prevent further superstitious hysteria from him. At an exorcism held at the farmhouse lead by local churchman Denning, Charlotte asks: ‘Do you only banish the evil spirits and not the benign?’, to which Denning responds ‘All that is present must be cast out’. As the exorcism begins, doors slam, ghostly gunfire ceases, and the phonograph begins to play Gabriel’s voice, which is calling out for his ‘daddy’, Nathan. In a panic to reveal the truth, and through concern for Nathan’s grieving mental state, Charlotte shows her husband the spirit of Gabriel in the Allshallows eve photograph, following which Denning is promptly cast out and the exorcism abruptly ends. Despite the fact that Charlotte knows that this is madness – ‘he’s dead’ she admonishes Nathan – she is still overcome with the need to protect her husband. 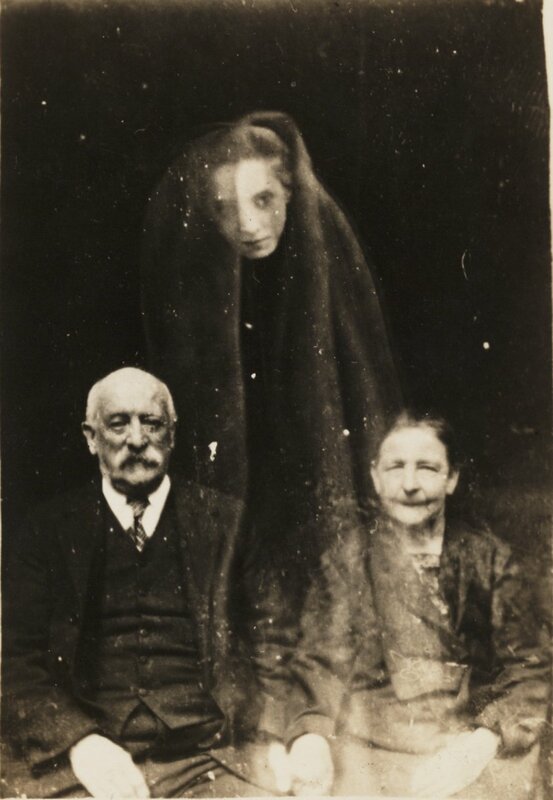 As medium of spirit photography, Charlotte is granted the power to decide who makes contact with the departed, an authority she chooses to use in a demonstration of her dedication to her husband by revealing Gabriel’s ghostly presence. Although Charlotte clearly struggles with the consequences of her dedication to the roles of traditional femininity, her femaleness is a factor which she utilises for her own ends. The role of women in photography and spiritualism traditionally results in women being acted upon by other forces, and to a certain extent, this is the case for Charlotte, particularly as her spirit photography is largely accidental. Despite this, however, Charlotte is shown to be both medium and master as ‘celestial telegrapher’. She is able to both fulfil her chosen role as committed wife (and later, contented mother), and as emancipated New Woman photographer and thus documenter of the spiritual ‘truth’. Through her abilities as a medium for the otherworldly, Charlotte is able to claim both private and public female spheres for her own desires. Dyhouse, Carol, Girl Trouble: Panic and Progress in the History of Young Women, (Fernwood Publishing, Canada: 2014), 42. Riches, Harriet, Women’s Role in Photography: From Handmaid to Hand-Made: Photography and Femininity, in Photoworks, Issue 22, 2015, 21. Warner, Marina, Phantasmagoria, (Oxford University Press, Oxford, 2006), 221. Tucker, Jennifer, Nature Exposed: Photography as Eyewitness in Victorian Science,(The John Hopkins University Press, USA: 2005), 86. This sounds like my kind of show. Great post!